Sofia Wylie‘s Andi Mack character, Buffy, is a total boss — and the same could be said about the actress IRL. The 13-year-old starlet teaches dance classes at Millennium Dance Studio and was even nominated for a J-14 Teen Icon Award for Icon of Tomorrow. In Andi Mack Season 2, her character is the first person who Cyrus comes out as gay to, and she’s fully supportive and there for her bestie. In this exclusive Q&A, Sofia tells J-14 how her character Buffy is evolving throughout the series, what it was like filming that emotional scene with Joshua Rush (spoiler: everyone was crying), and why it’s so important for her to empower young women on the Disney Channel and in her own life. J-14: How has your character Buffy evolved since Season 1? Sofia Wylie: While playing this amazing character created by Terri Minsky, I’ve learned that Buffy tends to be the glue that keeps the “good hair crew” (Buffy, Andi and Cyrus) safe and out of harm’s way. She sticks up for them and always lends an unconditional ear to both of them! Fans like Buffy because she’s a great role model – she’s strong, athletic, a great friend and excels at everything she does. I think fans will continue to fall in love with Buffy’s character because as the season goes by, you will learn why she is so tough and why she protects her friends at all costs. Buffy really evolves throughout the first season and you find that Cyrus and Andi rely on Buffy to be that strong and determined voice of reason for them all! 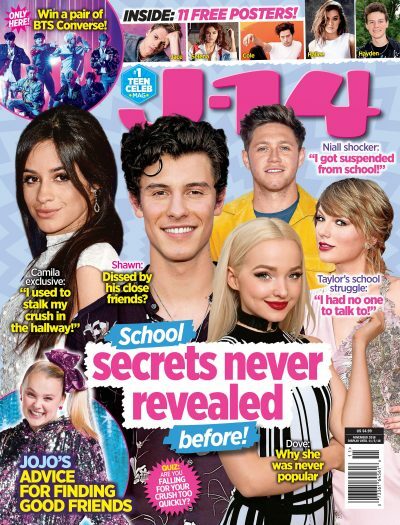 J-14: How is she growing in Season 2? SW: Buffy’s character continues to take off in Season 2. When she finds out there isn’t a girls’ basketball team at her school, she decides to try out for the boys’ basketball team even though she’s the only girl. Not only is she just as good as them, but she’s better and makes the team. She’s confident, works hard and doesn’t let anything or anyone get in the way of reaching her goals. Terri and the writers also give fans more of who Buffy is and answer the question ‘why is Buffy so competitive?’ You get to see more of her soft side, that she cares for people and that she wants the best for everyone. The most important thing I’ve learned from playing Buffy is to love your family and friends because you never know when things might change. J-14: When Buffy tries out for the boys’ basketball team, there’s some resistance. Have you ever had to deal with an experience like that? SW: As a professional dancer, I’ve been faced with many auditions, dance classes and competitions where the competitors are so determined to win that they end up doing things they later regret. What I’ve learned is that in the end, it’s not important to think of what everyone else is doing but rather to keep your focus on trying to be the best you that you can be! What I’ve learned from Buffy’s basketball team experience is, winning isn’t everything. J-14: Buffy is such a supportive friend and a great role model on Andi Mack. She’s also the first person Cyrus confides in about his sexuality. What was it like filming that scene? SW: On the day we shot the scene, the entire production crew was very quiet which set the stage for Josh and me to really get into the scene. I was honored to be a part of it and I hope it sets the stage for many more heartfelt moments on Andi Mack. The “Buffy and Cyrus scene” is so far my favorite scene in Andi Mack. As an actor, you always hope you get a chance to show the audience your depth of acting abilities. In this scene, I was given just that and I couldn’t be happier with the outcome! After shooting the scene, I thanked the series creator and executive producer Terri Minsky, our other executive producer Michelle Manning and the director Eyal Gordin for giving me this opportunity. Everyone had tears in their eyes! I also received several calls from people talking about how wonderful the scene was and sharing how much it meant to them. It still makes me tear up just thinking about it right now! J-14: Why is it important to you to empower younger girls to be positive, confident, and kind? SW: Growing up I always felt that I was the only kid with curly hair and darker skin. Because of this, I remember thinking that I didn’t fit in. I often felt that I wasn’t beautiful and it really lowered my self-esteem. I grew up very shy and I had a hard time being outgoing, positive or confident in myself. It wasn’t until recently that I learned to embrace my true self and love what God has given me! Once I started loving me for me, I noticed that I made more friends and I even started to book more jobs. All of this success came after I started loving myself. I know it’s not that easy for everyone but I’ve learned that I have an opportunity to send out a message that all kids, no matter what they look like or how negative they feel inside, are beautiful, confident, powerful and worth celebrating! J-14: Can you tell us a little more about teaching dance classes — how you started teaching and what you love about it? SW: I still consider myself a student of dance. Recently, I’ve been requested by dance studios and national dance conventions to come and teach and more importantly, speak to kids my age about my experience in the entertainment industry. As a teen, I can relate to kids and speak their language. So, what I try to do after teaching class is talk to them about life. To be honest, it’s the best part of my classes. I hope to use my career in acting, dancing and modeling to show all kids from different backgrounds that if I can do it, so can they! Streaming Guide Where Can You Catch Up on 'Andi Mack'? Say Bye to Netflix!